Matt Nolan is the UK's only cymbalsmith and gong maker. What began as a hobby with a blowtorch and bare feet in the kitchen soon snowballed into a near-obsessive fascination with sound and sculptural form. He now works full time creating metal percussion instruments by hand. Matt has earned an international reputation with clients for his bespoke work including Björk, Massive Attack, Dame Evelyn Glennie, Danny Elfman and many top Orchestras and Operas around the world. Matt uses ancient forging techniques in combination with modern-day materials to create instruments that range from the traditional to the cutting edge. He works with his hands, eyes and ears using simple mechanical tools – hammers, anvils and fire – to turn inanimate pieces of metal into "gorgeous instruments that not only sound great but blur the line between musical instruments and art" – Not So Modern Drummer magazine. Essentially self-taught, Matt made the switch from Electronic Engineer – designing silicon microchips in the broadband communications sector – to musical instrument maker in 2008. Drumhead Magazine dubbed him "21st Century Schizoid Man". He has played drums and percussion since his early teens and has performed in venues including the Barbican and Royal Festival Hall in London and the Kennedy Center in Washington D.C. His deeper fascination with cymbals in particular started in 2005. Matt feels that his work is the result of a particular combination of art, intuition and gut-feeling with physics, acoustics and materials science. Some instruments are very much about mathematics – tuned bells for example. Others are very much about unquantifiable complexity – cymbals and tam-tams especially. Then there are those that fall in the middle, like gongs, symphonic triangles, or the Gamelan-Celeste, co-created with Icelandic pipe-organ builder, Björgvin Tomasson, for Björk's "Biophilia" album and tour. In the end, however, they are all judged by the human ear. Matt believes that hand-crafted instruments produce the most expressive and rich sounds. Consider the difference between supermarket sliced bread and a loaf from your small, local, artisan baker. There is no substitute for taking your time and putting in the care and effort. One of Matt's larger cymbals may be formed from up to 10,000 individual hand hammer strokes. Even the cups of the cymbals are hand-hammered. Unlike with nearly every other cymbal you will find, Matt does not use a press. Musical instrument or sculpture? 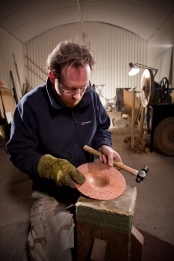 Beyond the revolutionary use of colours and textures on his work, Matt also makes "sculptural gongs" – gongs that are not the usual round shallow dome, but other interesting shapes. For example: hand-shaped or shaped like a bat's or dragon's wing. Not just any old shape will make a pleasant and usable sound though. Combining the visual with the acoustic is a careful balance. Percussion: the future is now. Over the last few decades, percussion instruments have been making big strides. They are now considered important solo instruments in contemporary orchestral circles and, in today's fast paced world, music is ever more about sound textures. Percussion has by far the widest range of instruments, sounds and playing techniques of any instrument family. It is one of Matt's aims to take this range further still. He hopes that his work will help to create a broader appreciation of percussion instruments and music as well as to encourage more innovation from other instrument builders. Matt is "leading the new breed" – Drum! Magazine.